Eating for Energy is a diet and weight loss program created by Yuri Elkaim, a fitness and wellness coach, holistic nutritionist and certified kinesiologist. He is the current Head Coach of Strength and Conditioning and nutrition for the University of Toronto men’s soccer program. As a former professional soccer player he came to discover the dramatic effect that changing his diet had on his athletic performance and energy levels. He wrote this book to help people obtain their best possible health, energy, performance and body through eating a living plant-based whole foods diet. In order to energize our bodies we need to eat foods that have a high level of “life force” while at the same time avoiding foods that take away more energy than they give us. Yuri Elkaim explains that raw fruit and vegetables have the highest energy levels and nutritional value so these are the foundation of the living food diet plan. Eating For Energy acknowledges that many people have difficulty maintaining a 100% raw food diet so some flexibility is built into the program. Certain cooked foods are permitted in small quantities, such as gluten-free grains and legumes. Additionally the occasional indulgence is allowed with dieters being encouraged to maintain at least 80% living raw plant-based foods. An entire section of the book is devoted to the subject of nutrition for athletes including advice on eating before, after and during exercise. Special recipes for athletes are also provided. Eating For Energy also includes a complete 12-week meal plan with recipes for juices, smoothies, salads, main meals and desserts. Living vegetables and fruit, sea vegetables, fresh juices, smoothies, spirulina, chlorella, coconut oil, avocado, olives, flaxseeds, hempseeds, pumpkin seeds, walnuts, fish oil, quinoa, amaranth, brown rice, lentils, garbanzos, whey protein. Regular exercise is encouraged in Eating For Energy because it strengthens the cardiovascular system, boosts immunity, prevents fat gain and improves sleep. Dieters are advised to walk for at least 30 minutes each day, engage in more intense aerobic exercise 2-4 times a week, do strength-training exercises 2-4 times a week and stretch every day. 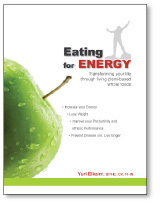 Eating for Energy: A Living Food Diet is available in eBook format for $39.95 (also called Ultimate Energy Diet). Learn more or purchase this diet plan here. Emphasizes foods that contain healthy fats. Includes guidelines to ease the transition to a living raw food diet. Flexible approach that does not require dieters to completely eliminate their favorite foods. Contains a 12-week meal plan with recipes. Provides tips for eating in restaurants, at work and while traveling. Some dieters may experience uncomfortable detox symptoms such as headaches and fatigue in the initial stages of the diet. Could be more expensive because of the large amounts of living, fresh (preferably organic) produce required. Living Food Diet is a program based on living plant-based foods in a flexible format that allows dieters to gradually change their way of eating. It includes a comprehensive 12-week meal plan with recipes, as well as unique information that applies specifically to athletes and physically active dieters. Eating For Energy will appeal to dieters who want to lose weight while at the same time creating a health promoting lifestyle, as well as those who are interested in eating a living food diet.